Last Friday we had a snake encounter. I smiled as my grandmother, mother, and sister came to mind. They had snake encounters, too. My grandmother, Florrie THOMAS MARTIN (1894-1979) was the wife of a tenant farmer. They moved from farm to farm, sometimes only staying for one growing season at a time. One swampy farm in the Northern Neck of Virginia had water moccasins hanging from the trees near the house. Florrie took a shotgun and shot them all, sometimes hitting two at a time there were so many of them. This story was always amazing to hear, but I already knew my grandma was a tough woman so it didn’t surprise me. My mom, Gladys MARTIN HEISER (1921-1999) often told my sister, Joyce, and me about her and her siblings handling snakes when they were kids. I got the impression they were small snakes like garter snakes and other non- poisonous ones. I’m sure as Mom reminisced, she had no idea the stories would lead to another up-close and personal snake encounter. One summer day when Joyce was 10 or 11, and I was 6 or 7, there was some excitement going on next door. Jimmy, who lived next door, had a snake in a cigar box. He and his friends were daring each other to pick it up, but each was too scared to do it. Joyce was the only girl over there with the boys and the snake. Jimmy handed the box to my sister and the whole bunch of kids paraded around the fence dividing the yards. Joyce knocked on the door to get Mom to come. Mom opened the door to find Joyce and a small troop of neighbor boys with her. I’m sure Mom was relieved to find out it was just a green garter snake and not a big one, at that. But I’m sure she worried that her severely crippled, arthritic hands might not be fit for snake handling any longer. Mom managed to pick it up enough to show Joyce how to do it. Joyce then reached into the cigar box and carefully picked up the snake. As she triumphantly turned around to show the boys, they all scattered off the porch and into the street. None of the boys ever did handle that snake. 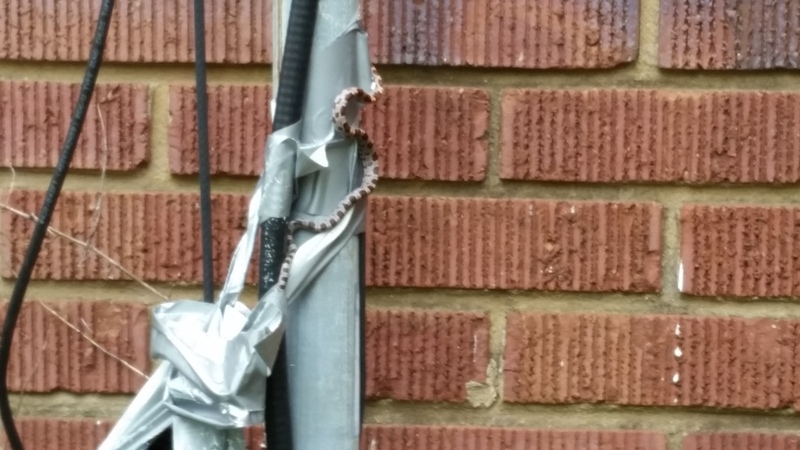 This past Friday my daughter, Lara, called my attention to a snake resting on an antenna pole close to the house. It wasn’t a huge snake, maybe a foot long, but we thought it might be a copperhead. 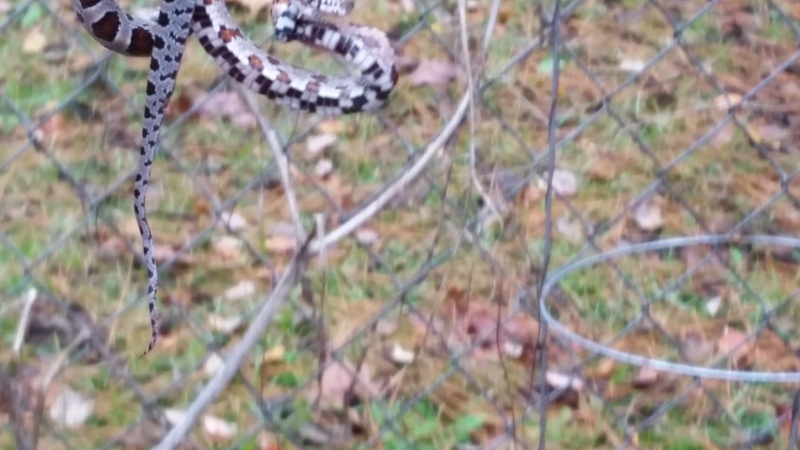 A few photos taken and sent to the local wildlife center revealed it was actually a juvenile Eastern Rat Snake, a good snake to have around because they eat copperheads. The snake hadn’t moved for a few hours by the time Katie, my other daughter, stopped in for lunch. She looked and said she thought it was stuck to a downturned piece of duct tape on the pole. I told her to take a long broom handle and nudge its tail a little bit to see if it would move. Lara and I watched from a nearby window. When I took out my phone to take a photo, Lara said, “Hit record.” So I did. It was a good idea in case I had to explain to EMS or Katie’s husband how she came to have a snake bite. Once it was established that the snake was indeed stuck, Katie went in for a closer examination. Lara and I looked at each other with big eyes as Katie’s face was within a few inches of the snake’s, but nothing exciting happened. Animal control came and rescued the snake about an hour later. It was released unharmed at the back of my property. Best photo I could get after animal control came. It was a squirmy snake! When Joyce watched the video the next day she said it looked like something she herself would do. No surprise there! Joyce also said, “It would have been hilarious if the snake had smacked Katie in the face with its tail.” Yes, it would have. Do you have any wild animal encounters in your family history? If so, share below in a comment. Funny you should write about this. Last month, we were in the living room when we heard a terrible racket. We walked around inside the house, trying to determine the source. It was much louder when we walked into the kitchen, and even worse when I opened the back door. I came back inside and turned off the AC. Silence. So I called our HVAC people and they sent someone out to investigate. Of course, when he turned on the AC, there was nothing. I insisted he take off the panel and look inside the compressor, because I thought a fan blade had sheared off. Within minutes, he called me over to look. What we had heard was the slicing and dicing of a snake who had crawled into the unit and had slithered up too high. The fan caught him and cut him to ribbons. All we could see were pieces. It certainly has discouraged me from working barefoot in the back patio! Oh, my! That would discourage me from working barefoot outside, too. Thanks for sharing you story, Mary! Thanks for an interesting overview of your family’s last four generations of snake ‘handlers’! Your grandma, mother, sister and daughter are much braver than me! I grew up on a small crops farm which abounded with snakes – as did the local community. Dad often needed to shoot snakes – many on our small farm; some even on the roads when snakes put our car or family in danger. As a child, I feared snakes. They starred regularly in my nightmares. 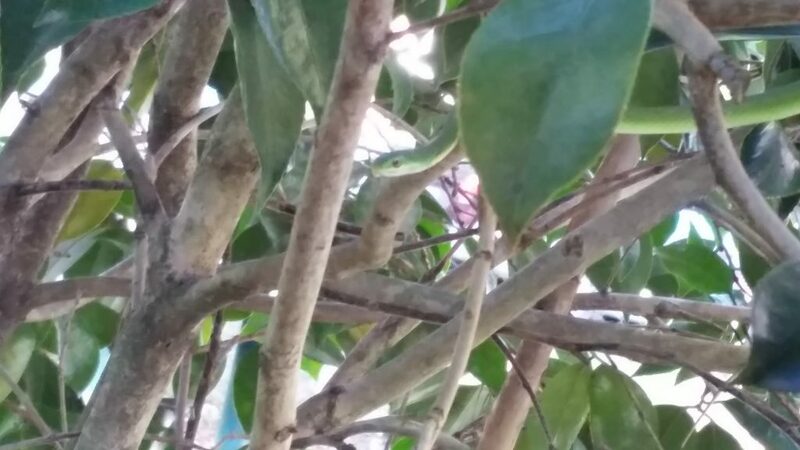 My parents drilled me as soon as they could about dangerous Australian brown snakes in our area. One day when only a little child, I saw one close to the side of our house. I raised the alarm while running inside. My parents’ training paid off! My favourite memory of a snake on the farm occurred in the shed next to the house, where we packed produce for market. I noticed, lying across the entrance to the shed what looked like a thin rolled carpet. Appearing so innocuously, it took me a little time to realise it was a patterned blue and green snake. Soon after I learnt this carpet snake was harmless to us.